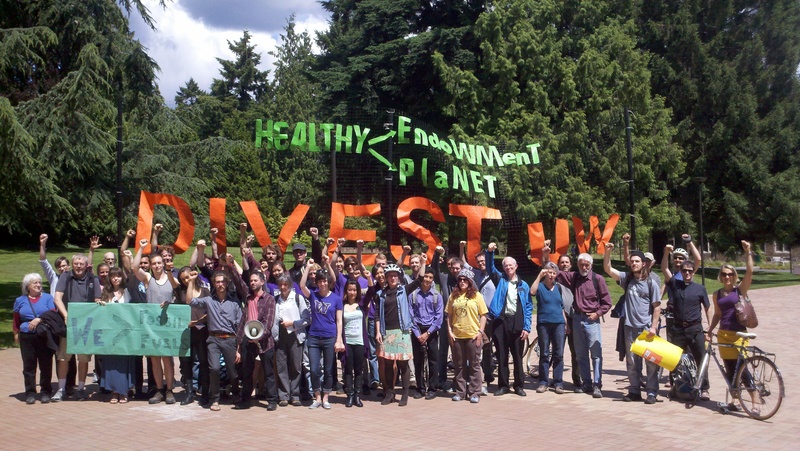 Thanks to Seattle U student activists, a festival of speakers and workshops from a variety of local groups will grace the Seattle University Pigott Building, Sunday April 27th, beginning with the philosopher, naturalist, and climate speaker Kathleen Dean Moore ( author of Riverwalking, Wild Comfort, Moral Ground among others). Bring the family and discover a world of change that starts with people power. 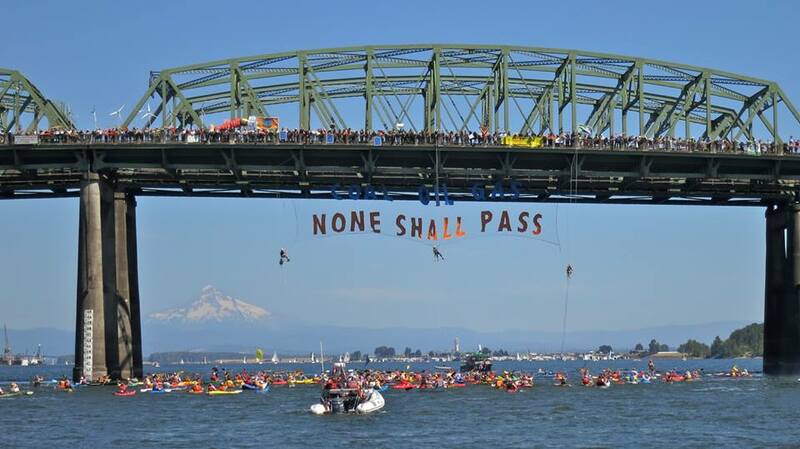 The Global Climate Convergence, 10 days of global actions from Earth Day to May Day, connects groups like 350.org, Idle No More, Backbone Campaign, Compassionate Seattle, fostering climate, social, and economic justice. Renew your energy and commitment in an afternoon of celebration and education. Stir your heart to action. *Backbone hosts Anti-Oppression training from 9am – 12pm, & 1:45-5:00pm. Don’t forget Earth Day, Tuesday April 22nd! Honor our mom with trees in the name of climate justice. Zoe eloquently delivered her public comments against the Keystone XL pipeline to a freezing crowd of 350.org supporters outside the federal building in Seattle, WA. The report from the State Dept on whether the international pipeline gets completed will go to the President in May. As I write you only have 3 hours left to submit a comment (by midnight EST Friday March 7th, 2014 to the State Dept http://www.regulations.gov/#!submitComment;D=DOS-2014-0003-0001) for the report headed to the President’s desk, your opinion on the Keystone XL pipeline doesn’t count. Well, OK, your opinion still counts, and you can still make a ruckus and be heard; you can call the President’s White House line right now. In fact you can write the editor, join a protest, and get your neighbors to join you. But you won’t be counted among over 2,000,000 comments environmental groups delivered to the Dept of State this month opposing the Keystone XL pipeline. With this deadline, the time for the President to decide moves one step closer. We carbon-based lifeforms simply can’t allow tar sands into the pipeline. No matter what the law allows, our children won’t survive the Keystone XL. Why such a fuss over one oil pipeline? It’s true there are other pipelines, and trains, moving Canada’s product south. And it’s true we need oil to drive around. The Keystone XL pipeline leads to a Carbon Bomb that we must leave in the ground. Since Alberta tar sands oil is already showing up in our gas tanks, we all have to drive less, and find ways to stop the oil trains and other pipelines delivering this extra deadly stuff from Canada, and from the Bakken Shale fracking wells in North Dakota. Our children depend on us now to stop using fossil fuels. No More “All Of The Above” Energy As for the President, he has a chance to choose dirty energy or clean energy with the stroke of a pen. Until now he has expanded both kinds, simultaneously leading greater expansion in renewables and in our fossil fuel extraction faster than George W. Bush. The fracking creates boomtowns and jobs for roughnecks, but risks contaminating our water supplies. But opening up a pipeline to 800,000 barrels of tar sands every day, or not, stands as the greatest single climate decision he gets to make as President. Chris Hayes articulates our chemical addiction and the President’s “intervention moment”. http://www.msnbc.com/all-in/watch/keystone-xl-time-to-end-the-addiction-132949571674 an excellent commentary. 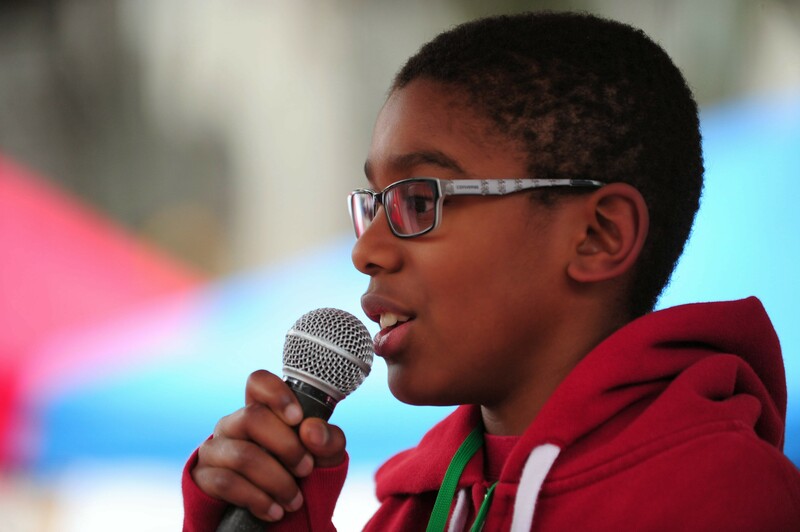 “I’m here to draw the line because my future is on that line,” says Gabriel Mandell, 11, a climate justice ambassador at a recent rally in Seattle. 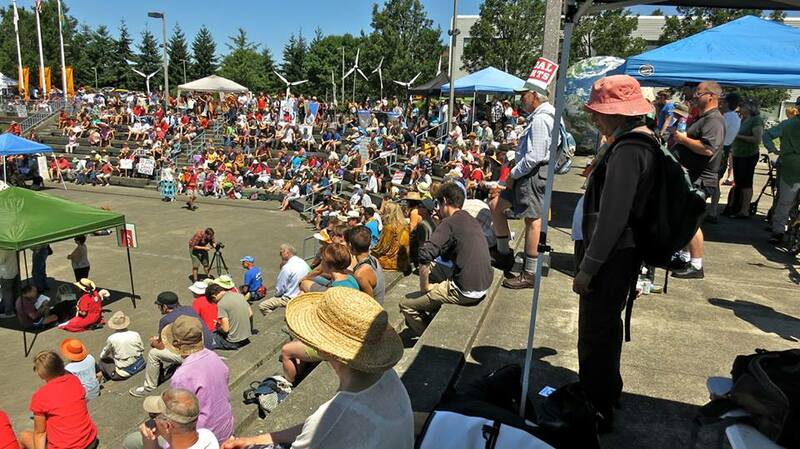 SEATTLE — Gabriel Mandell is standing on stage at a recent anti-climate rally at a Seattle park squeezed between the railroad tracks and Elliott Bay. The crowd of hundreds cheers in agreement. Mandell’s voice is big and booming, but the rest of him is quite small. He’s 11 years old, just starting middle school. 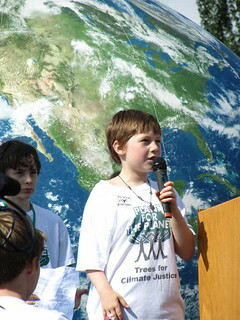 And he’s flanked by a handful of other adolescents, kids who call themselves climate justice ambassadors. 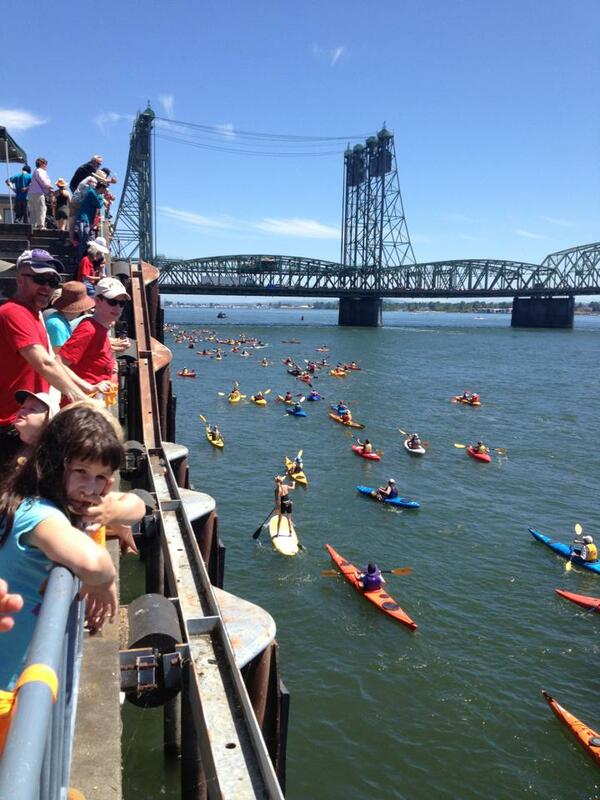 “We want you to look at our faces to remind you why we need to draw the line against fossil fuel exports in the Northwest,” Mandell says to the crowd. Mandell and his crew are part of a growing number of children worldwide who are asking adults and governments to take action to fight climate change and reduce greenhouse gas emissions. A recent Unicef study (pdf) found that children around the world will bear the brunt of the impact of climate change. The study points out that children growing up today will experience first hand effects of climate change in the form of increased droughts, floods and storms. In the 10 most vulnerable countries, including India, Bangladesh and the Philippines, there are 620 million children under 18. Mandell says he was inspired by the story of a 9-year-old boy from Germany named Felix Finkbeiner who started the Plant-for-the-Planet campaign, an effort to plant a billion trees worldwide. Subsequent Plant-for-the-Planet chapters have sprung up around the world with children participating in academies to learn how to make an impact by studying climate change effects and developing public speaking skills. 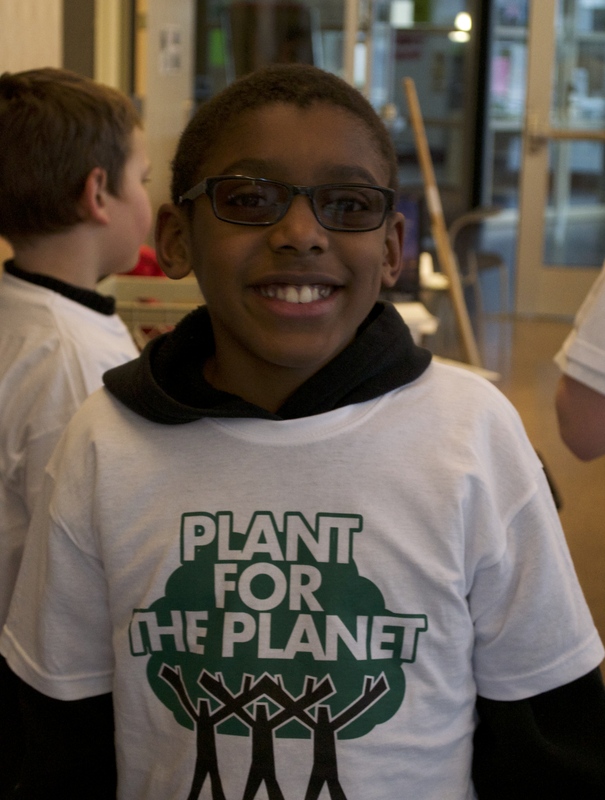 This past spring the first Plant-for-the-Planet Academy in the United States took place in Seattle and Mandell was one of 80 children to participate. On Oct. 26, two more academies are being held in Seattle with space for 160 children. Michael Foster is the behind-the-scenes parent organizing these workshops. His two daughters took part in the May workshop and have since taken action through planting trees, writing letters, talking to elected officials and giving public presentations about the impacts of climate change. Children talking about climate change are difficult to ignore, Foster says. Watch Rachel’s testimony in the EarthFix documentary COAL. Mandell, following in Howell’s footsteps, spoke this week in Tacoma at the final scoping hearing for the proposed Longview coal export terminal. Do you want to help future generations speak? Hear what they have to say. And Click Here to view the entire hour of inspirational speakers.